THIS would be hard to fathom for the likes of Nathan Cleary, Latrell Mitchell and Jack de Belin. 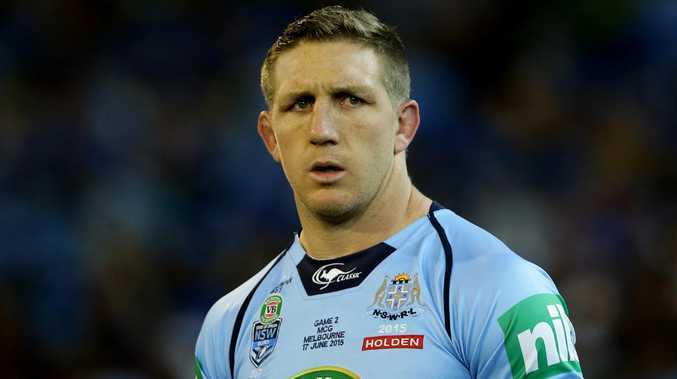 But in a glittering club and representative career, there was one box Ryan Hoffman thought he'd never tick - a State of Origin series victory. The Canberra-born youngster had been on a cursed path to a sky blue jersey since being enrolled in famed rugby league nursery St Gregory's Campbelltown. In 2002 as a Year 12 student, Hoffman captained the New South Wales Combined Catholic Colleges team at the Australian championships, before touring France and the UK later that year in the green and gold. After later becoming an integral member of a dominant Melbourne Storm, he was rewarded with his first Blues start in Game II, 2007. The 10-6 loss in Sydney handed the Maroons their second straight series win, but as a young buck, Hoffman couldn't have imagined the Canetoads were only enjoying the beginning of an unprecedented era of success. The next year he was picked to start in the back-row and after a hard fought 18-10 victory in Game I at Stadium Australia, he was ready to help deny the Queenslanders a threepeat and tick the series-winning box. Then the Maroons flogged the Blues at Lang Park and edged them in the decider back in Sydney. He didn't play for NSW again until 2013. And in eerily familiar circumstances the Maroons came from behind winning the last two fixtures to take home the shield and keep their streak alive. Hence why, when Trent Hodkinson threw a dummy to his left and sliced through the Queensland defence to seal the 2014 series, it was a very special feeling for a man who'd done just about everything else he could in the game. "Certainly in my career, breaking the streak for the Maroons playing for the Blues in 2014 - that was a massive highlight it really was," he said at his retirement press conference. "Because it was looking there for a while like that was going to be the one thing I would miss out on." Indeed, he'd already won three grand finals, a Challenge Cup with Wigan, and been a part of the Kangaroos' 2009 Four Nations triumph. The obvious black cloud over his 300-plus game career was the 2010 salary cap scandal that culminated in the Storm being stripped of their 2007 and 2009 premierships, and playing for no points in 2010. But rather than lament those dark days, Hoffman said it made their 2012 premiership all the more gratifying. Melbourne Storm celebrate their 2012 NRL grand final win over the Bulldogs. "I wouldn't say it's a highlight but certainly a big moment was 2010," he said. "Because I think 2010 proved what this club is really about, and what these players are really about, what Craig (Bellamy) was really about. "And like I said certainly not a highlight but a massive moment, which I think helped shaped a lot of things in my career and in this club. "Certainly coming back after what happened in 2010, going away in 2011 and winning the premiership in 2012 there was a bit of vindication there, and that was certainly a special moment."